This story of Wes Anderson and Owen Wilson, “the boys,” is a plucky tale of grit and high purpose. Wes and Owen are Texans, and so their endless fascination with the ol’ game of life (and the enormous sophistication of thought they bring to that game) is very often concealed behind tight-lipped rhetoric with a distinct sense of the absurd, the joke of it all, which they exhibit whenever there is danger in the air. Think Slim Pickens in Dr. Strangelove. From past tours of Texas, I had come to appreciate the heart of the state’s culture long before I met the authors of Bottle Rocket. I was spoon-fed my most major Texas epiphany in one interview: a young man explained to me why he had fathered children when he was just past twenty, though he was fully aware that the decision meant shelving dreams and throwing out some fervent youthful ambitions to settle for doggedly making ends meet. His reason was: “I want my children to have a real knowledge of their grandparents. So I had to have them early to give them the years.” Family, real and extended, is at the core of Bottle Rocket. Dignan (my vote for the greatest name in film) and Anthony are brothers in all respects save blood, and though separable, their tie is indestructible. So it is with the coauthors of Bottle Rocket, Wes Anderson (also the director) and Owen Wilson (also the star). The other star of the film is Luke Wilson, Owen’s brother; two other key cast members are Andrew Wilson, also a brother, and Bob Musgrave, a lifelong friend. All of them lived together in a glop in the same Dallas apartment when I first met them. Now that Wes has distinguished himself as one of the leading young directors in film, and Owen and Luke have become respected, sought-after, and very highly paid actors, they all have naturally gone upscale. These days they live together in a glop in Hollywood. To get through the stuff of publicity as quickly as possible: Bottle Rocket was born as a thirteen-minute video shown at Sundance (it finished third at some festival for shorts). They had been mentored for a year by producer Barbara Boyle and writer Kit Carson. Barbara brought the short and the resulting full-length screenplay to Polly Platt, an associate of mine, who championed it to me and urged me to go down to Texas to meet with the boys, after which we brought Wes and Owen to Hollywood, where they spent a solid year rewriting and another year making the picture, which was released to critical acclaim. When I first saw the thirteen-minute video I was dazzled—the language and rhythms of the piece made it clear Wes and Owen were genuine voices. The possession of a real voice is always a marvel, an almost religious thing. When you have one, it not only means you see things from a slightly different perspective than the billions of other ants on the hill, but that you also necessarily possess such equally rare qualities as integrity and humility. It’s part of the package of being a real voice, ’cause when your voice is real, you can’t screw around. The voice must be served; all other exit doors, marked “expediency” or “solid career move,” are sealed over, and the only way out of your inner torment is genuine self-expression. So, I’m in Dallas meeting the boys who had done the short, and I suggest that the next morning we should read the script aloud. They were so raw and new at writing and directing that it had never occurred to them to read the script aloud, even though practically the entire cast lived in the same glop of humanity and was never unavailable. Wes and Owen figured you write it, you sell it, and then make it or die. Reading it aloud was froufrou. When we conducted the reading we discovered, for reasons I’ll never fully understand, that an ordinary number of script pages had produced the longest entertainment known to man, beating Wagner’s Ring cycle before we reached the halfway point of the reading. By the time we approached the last scene, all the water pitchers had been emptied, yet voices still rasped from overuse, and there were people in the room showing the physical signs of starvation. Finally it was over. I nodded at everyone; the truth was so obvious that no words were needed. I thought, from my Hollywood perch, that it had been an enormously revealing exercise, clearly showing the staging ground for the next draft. The appropriate dialogue was for Wes and Owen to thank me for the revelation of my suggested reading and for them to contact me in three or four years, after they’d blasted through the mountain of words and laid out some sort of narrative road. We said our good-byes and I walked across the street, when Wes loudly blurted for me to wait. He crossed to me and stood very close. In the years I’ve known him since, I don’t think he’s ever again stood quite so close. “Are you going to make the movie?” he asked. I started to answer that it was impossible to tell at this point. But he interrupted my pre­amble. “Are you going to make the movie?” he asked again. I started to answer anew and realized this very basic question was such a matter of survival to him that he simply couldn’t endure any long-winded answer. So I said, “I don’t know, man.” He nodded and walked away. Not long thereafter, we brought Wes and Owen from Dallas to Hollywood. They were given offices on the Sony Studios lot. They were in their early twenties and had a script deal. They now slumbered in the very belly of the beast they had coveted since they first met in a ­playwriting workshop at the University of Texas. They were film guys now to the IRS as well as to themselves and their parents. They had imagined this life from afar for so long that, now with actual physical contact with the movie industry they had lusted after and its powerful seductions, there was the distinct danger of the boys going wrong. Not to worry. Somehow these guys arrived in town with a concrete bunker protecting their cores. Their first brushes with agents and execs left them without a dent. Wes’ persona was a major help. No matter what they thought of him in the jock-infested world of his youth, here in Hollywood he was an intimidating presence. First off, he looked like a genius. There was some Einstein thing with his hair, plus he was rickets thin and shabbily dressed. When he looked at agents and did that long think before saying any words at all, you could see the sweat staining the Egyptian cotton of the agents’ shirts. Yes, it was the sharpies who began to break and stammer and attempt to change their styles under the unblinking gaze of the two newcomers. I worked with Wes and Owen for the better and worser part of a year, and they were like no writing team I’d ever encountered. First of all, you could never catch them communicating with each other in front of you. Nor could you pressure them into actually expressing an individual reaction on the spot to something you said. Yet they weren’t rude. It was some trick or talent, and it was always there, always. I would pitch some idea or notion about a scene, and there it would end. One of them might jot a note, but that was it. And it’s not as if I didn’t prod them with a “So what do you think?” And it wasn’t silence that came back from such direct assaults, at least not technically, because words were muttered by them. But never words that fit together in anything resembling declarative thought. Our times were pleasant enough; Owen is a great laugher. I never in my life met anyone who laughed more often and still seemed genuinely surprised every time he did. When the script was finished and we were all set to go, we ran into a solid wall of resistance. Even with a lot of experience, I did not see the problem coming. It took every flex of every muscle our small but not insignificant film company, Gracie Film, had to get the powers that be to cough up the five million dollars needed to produce this highly personal film. But cough they finally did, and after well over a year, the boys were back in Texas, this time to direct and star in a major studio picture. Early in the course of the actual filmmaking, that which could not be seen became wildly apparent. Wes and Owen knew their stuff. Owen proved as an actor, as well as a writer, to be incapable of a dishonest moment. Wes, who unquestioningly fretted mightily through every moment of the day, still maintained the outward appearance of cool control. He was sure-handed and knowing in all aspects of directing. He was—as they call everyone who has killed themselves preparing in every conceivable way for what may be their one and only shot at the only job they imagine—a natural. Nonetheless, the finish of principal photography led only to the toughest mettle tests to date. The film’s test previews were torture. Richard Sakai, one of the producers and the head of our little company, held the film’s coterie together. He does not rattle, and after such screenings we’d cluster around him, frequently unable to locate Wes. This personal, spirited, original piece of work was walking exactly the same market-­testing plank as big Hollywood genre pics. Oh, God, what had we done to them? They had been safe in Texas. Owen worked at Blockbuster in Dallas, so the boys had free movies every night; they were within driving distance of their moms and dads’; they had their buddies, the constant energetic dialogues planning their futures. Now there was only the din of dashed hopes. Bottle Rocket was written off. I think the boys felt it, and I knew it cold. Some connected with the movie drifted away to nurse their pain; others, most notably Richard, never wavered. But finally, though seriously rattled, Wes and Owen were sustained by the work. They never lost their hold on the truth. They had got to do the jobs they loved. Finally, that is the edge. Wes managed to get a great and appropriate score for less money than anyone would have thought possible. And in this experience, as in virtually all other areas of postproduction, someone like music editor Kim Naves would see the film and go nuts over it, and the reaction would pick everyone up. The studio gave us the funds for another couple of days of shooting. Owen and Wes went off to write a new opening, and despite the pressure, they were once more buoyant from being able to write some scenes and then film them. It was getting Capraesque. Even I was feeling the glow. Lord love our noble little group and the film we served. In the middle of all this heart, drive, and ­renewal, the cruelest of events stopped us in our tracks. 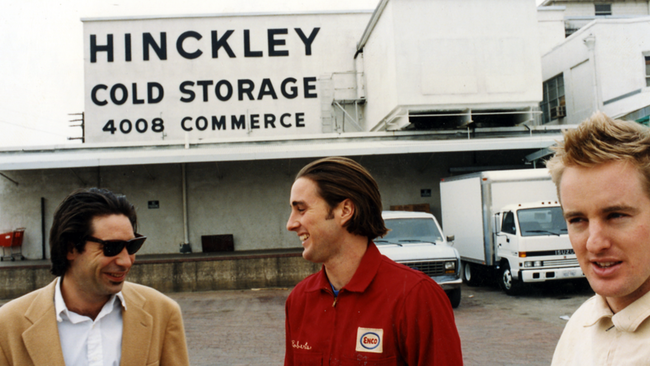 Bottle Rocket, the child of the Sundance Shorts Program, was disowned and disinherited by the Sundance Film Festival. The festival refused to admit the film into its competition. This rejection hit the boys harder than anything else. The very people for whom they felt greatest fealty cast them out. The rejection rocked their cage. I felt enraged and helpless. But I think the truly awful things in life, when they occur, bring with them the call to dignity. Owen and Wes conducted themselves with extraordinary e’lan. They took the full hit of the turndown, conceded the pain and confusion it caused them, and recommitted themselves to the work. The film received any number of selections to ten-best lists, standing alongside such films of that year as The English Patient, Jerry Maguire, and Fargo. Bottle Rocket was not a commercial ­success, but it was celebrated and embraced by a core of passionate fans, and the critical benedictions launched three careers. Owen and Wes went to work writing Rushmore, which at the time of writing has been hailed in three film ­festivals: Telluride, Toronto, and New York. Luke and Owen Wilson are sought-after actors, and Wes Anderson is now an established director. The Turan review (and others like it) without exaggeration saved Wes’ and Owen’s lives, for life can be very tough on those who find that existence only makes sense if someone lets them make movies. The lack of a logical alternative creates more peril than opportunity. The rites of passage Wes and Owen moved through during the time we worked on Bottle Rocket were brutal. They have pulled off the hardest trick of all in contemporary American film: they have won the freedom to use movies as a form of self-expression. Frequently, writers and directors, in order to maintain employability, hold to a career course of “one for us and one for them,” meaning alternately suffocating one’s own tastes to do the system’s bidding in the preposterous belief that the system, in return, will allow the search for artistic fulfillment on alternate jobs. Wes and Owen need not walk that screwy path. They have no choice but to keep things simple. They will do their act. If they weren’t writing their scripts, nothing at all like those scripts would exist. And I believe such will always be the case for “the boys.” Wow. This piece was written as the introduction to the Rushmore screenplay, published in 1999 by Faber & Faber.